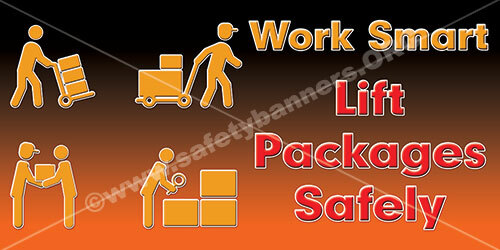 Safety Banners for Proper Lifting and Lifting Techniques. Using proper lifting techniques prevents lifting back injuries! 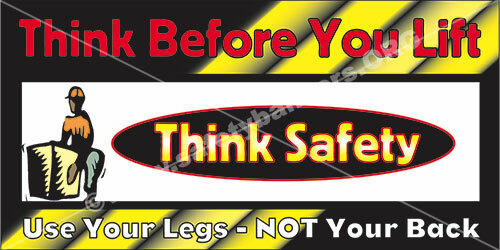 Safety Banners Can help. 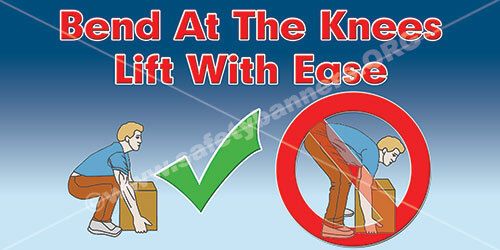 Lifting properly is a very important aspect of preventing back problems. Preventing back injuries is a major challenge for employers. According to the Bureau of Labor Statistics, more than one million workers suffer back injuries each year. Typically, back injuries account for 20% of all workplace injuries and illnesses, and one-fourth of all compensation claims are a result of back injuries. The pain and discomfort of back injuries can have a dramatic change in employee productivity. A Bureau of Labor Statistics survey shows that four out of five back injuries were to the lower back, and that three out of four occurred while lifting. This survey shows the importance of reducing back injuries caused by lifting. Although no approach has completely eliminated such injuries, a substantial portion could be prevented by incorporating an effective control program along with an ergonomics analysis and design of work tasks. 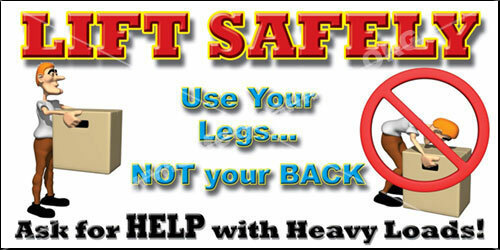 OSHA has evaluated ways to help prevent lifting injuries. They specify two types of controls: engineering and administrative. Engineering controls are used to redesign the workstation to minimize lifting hazards. Administrative controls include carefully selecting and training workers, so that they can perform their jobs safely. Strength testing of existing workers: Studies have shown strength testing can prevent up to one-third of all work-related injuries. Through the strength-testing process, employers can discourage employees from performing tasks that exceed their strength capacities. Physical conditioning or stretching programs - - These programs are implemented to reduce the risk of muscle strain. Training - - Employees should be trained to utilize proper lifting techniques that place minimum stress on the lower back. Before lifting, take a moment to think about what you are about to do. Examine the object for sharp corners, slippery spots or other potential hazards. Know your limit and do not try to exceed it. Ask for help if needed. Or if possible, divide the load to make it lighter. Know where you are going to set the item down and make sure the destination and your path are free of obstructions. Then follow these steps. 1. Stand close to the load with your feet spread shoulder width apart. One foot should be slightly in front of the other for balance. 2. Squat down bending at the knees (not your waist). Tuck your chin while keeping your back as vertical as possible. 3. 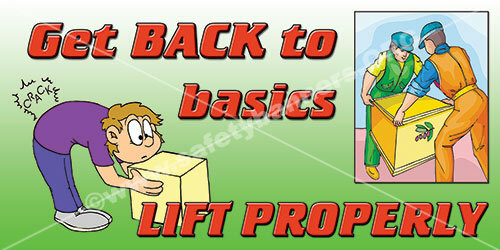 Get a firm grasp of the object before beginning the lift. 4. Slowly begin straightening your legs, lifting slowly. Never twist your body during this step.